MINSK — At the age of 36, Yishai Malkin and his family are leading what millions of people in the former Soviet Union would consider a charmed life. A web designer, Malkin and his wife, an event manager, earn a combined monthly salary of $2,000. That’s comfortable enough to allow them to travel abroad and pay the mortgage for the centrally located riverview apartment where they live with their six-year-old son. 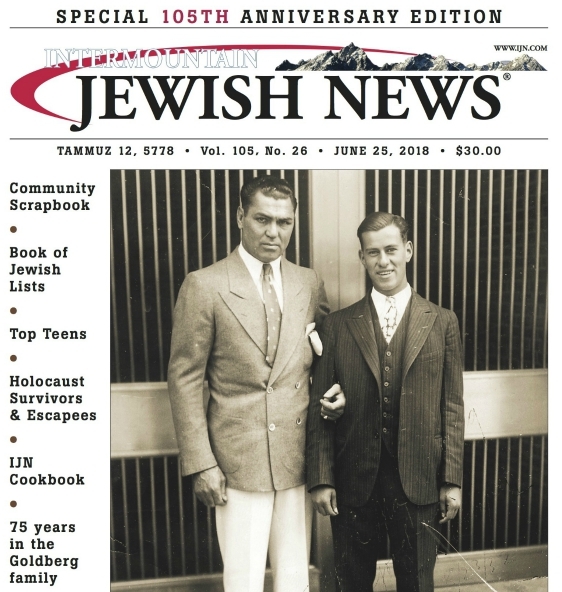 “We have made a very good life for us in this country,” Malkin told JTA in a recent interview at his home, which is a stone’s throw from this capital city’s main synagogue and several kosher shops in an area where Jews say anti-Semitic harassment never occurs. It’s not the kind of statement one associates with members of a minority living in what is often called in the international media “Europe’s last dictatorship” — referring to the authoritarian regime of Alexander Lukashenko, the country’s president since 1994. Nonetheless, it reflects reality for many Jews in Belarus, where they enjoy less freedom but more stability and security than in some of the region’s chaotic democracies, with their rising xenophobia and nationalism. Still, critics of Lukashenko’s regime insist that its disregard for civil and human rights inevitably has a negative effect on local Jews — including in the absence of legal protection for their heritage sites. Last month, a Belarusian court approved a plan to construct luxury apartment buildings on a former Jewish cemetery in the eastern city of Gomel. That prompted the country’s Union of Public Associations and Jewish Communities to signal its “concern” — a rare sign of disagreement with the government in a country where the judiciary is merely an extension of the executive branch. In recent years, Belarus has seen none of the anti-Semitic violence that regularly occurs in neighboring countries like Ukraine. There is next to no Holocaust revisionism and glorification of pro-Nazi nationalists in Belarus — its government encourages nostalgia for the Soviet Union and has kept street names celebrating communist institutions. In 2016, the lifting of visa requirements for American and EU citizens wishing to visit Belarus as tourists — a concession that had been extended to Israelis in 2014 — ended the country’s relative isolation. Belarus is now attracting large numbers of Western tourists who are fast becoming a major source of income. Minsk — a safe, clean and inexpensive city — features stunning examples of Soviet architecture. The Minsk Opera is widely recognized as one of that style’s most beautiful specimens. The Belarus Jewish community of 20,000 is also benefiting from tourists visiting Jewish heritage sites that in their significance and beauty easily match anything on offer in Ukraine, Russia, Lithuania or Poland. Some of the top attractions include the grave of Israel Meir Kagan, or the Chofetz Chaim, perhaps the most influential rabbis in Europe before the Holocaust. The 16th-century synagogue in Grodno, which UNESCO in 2007 considered declaring a World Heritage Site, also attracts a steady stream of visitors, as does the Khatyn Holocaust monument. The small Jewish shtetls of Pinsk and Babruysk are among the very last of their kind in Europe. Since 2014, hundreds of Jews, including foreigners, have gathered at the annual Limmud FSU Jewish learning festival, which Malkin said has vitalized the local community. “You see a growing stream of Jews from the West visiting the very rich heritage sites here, and of course this strengthens the Jewish community because it sort of puts us on the world map of Jewish communities,” said Shnuer Deitch, the country’s chief rabbi. Deitch and his wife, Chabad emissaries, have been operating a Jewish school for years in Belarus, where kosher meat and dairy from Russia is widely available to observant congregants. But Belarus’ treatment of its Jewish heritage sites in recent months has exposed the government to unprecedented criticism by local and international Jewish groups. The Euro-Asian Jewish Congress voiced its “strong opposition” to the planned apartment building in Gomel. It dismissed the Belarusian government’s claims that the construction on the cemetery site was okayed by Gomel’s Jewish community and was unlikely to disturb the remains there. The World Jewish Congress said the plan, was in violation of Belarus’ international commitment to preserve Jewish heritage sites. A leader of the fight against the Gomel plan is Yakov Goodman, a Jewish-American activist for the preservation of Jewish heritage sites in his native Belarus. He told JTA that the plan was indicative of “state anti-Semitism” and was one of several cases of disregard for Jewish heritage sites. Such disregard, he said, does not occur with assets that are important or holy to Christians and the general population. Goodman, who was imprisoned briefly in 2004 for his activism, has called out the Belarusian government for allegedly destroying three synagogues — two in Minsk and one in Luban — and at least three Jewish cemeteries in addition to the former burial ground threatened in Gomel. Jewish heritage sites are desecrated, destroyed and built over regularly across Eastern Europe, where small communities decimated during the Holocaust struggle to preserve massive properties that belonged to once-huge congregations. “But the difference is that in Belarus, Jews can’t even speak out against this,” Goodman said. Sergey Lyapin, a Jewish social activist, said in a recent statement that “the local authorities and state-controlled media are waging an information war against” Jews opposed to the construction. To Rahim Radhani, a Muslim immigrant from Uzbekistan who lives in Minsk, the rhetoric in Belarusian media and the government’s refusal to heed Jewish concerns are signs that Jews are ultimately in danger of being targeted by authorities in Belarus, where he says other minorities are already subjected to discrimination. Opposition activists may be imprisoned here, but ordinary people, he said, “and especially Jews, who don’t want to do politics but simply want to live in peace, are better off living in Belarus than across the border” in Ukraine.